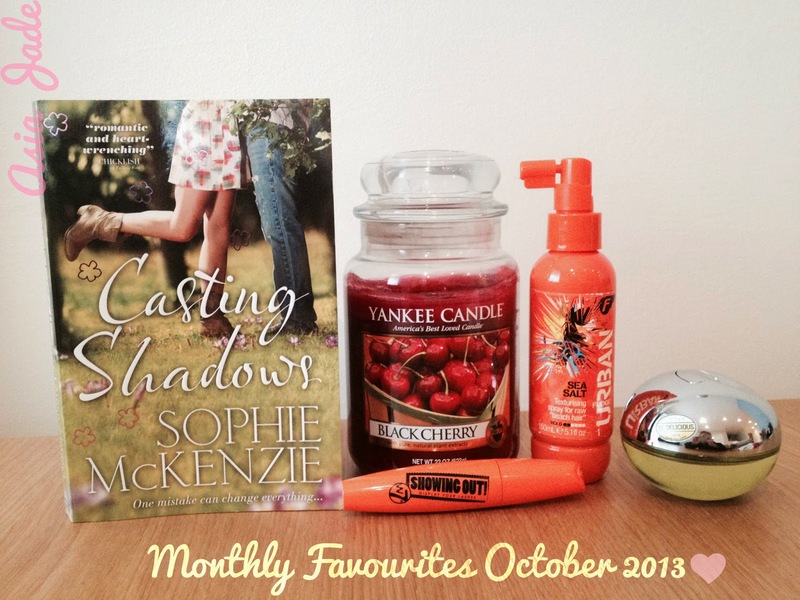 Today’s post is going to be my monthly favourites. If you don’t know what monthly favourites is it’s basically where I share with you the things that I’ve been loving each month. It could be a whole load of products and other bits and bobs or it could be a few like today. I’ll always try to include beauty products but also lifestyle ones too along with my favourite songs of the month. Casting Shadows is the third installment in the Flynn Series. I’m loving this whole series because it’s so romantic yet gripping. I love many of Sophie Mckenzies series to name a few Girl, Missing Series and Luke and Eve Series. I’m not going to say what the series is about in detail because that will just ruin it but it’s basically a boy and a girl who fall in love deep love. I recommend all three of these series because they’re truly amazing. Each series has a different story line but they all make you not want to put the book down they’re that amazing!! I’ve only just discovered Yankee Candles well I mean I’ve only just got round to buying one. I decided to go with Black Cherry because I love cherries and the smell of Black Cherry is amazing it’s also kind of an Autumn scent. I would of gone with one of the specific Autumn scent’s but some of them made me feel sick they were too rich. I’d defiantly love to purchase more of these in the future because they fill the room with the scent it’s pretty amazing. Most candles just fill a corner of the room then the scent dies out. Sea Salt is great for adding texture to your hair when it’s dry. It creates that raw beach look that you get once your hair has dried after being in the sea. I love this sea salt because it smells great and lasts a long time. I prefer adding the spray once my hair is upside down then scrunching it to create that beach look. Because it adds more volume and texture to your hair. I would say that sometimes you need to spray quite a lot depending on the look you’re going for. I got this perfume during the summer from my dad. I absolutely love it although it does have quite a strong smell to it at first but it wears out during the day to give it a lovely long lasting smell. I love the design of it as it’s suppose to be an apple and I love apples because they’re delicious which is probably why it’s called Be Delicious. This mascara is great because it adds volume to your lashes. I recommend this mascara because it’s cheap but it also lasts a long time. It has an amazing large thick brush with a small round globe brush at the top to apply mascara to all those tricky places. How beautiful is Ariana Grande? Let alone her first album it’s truly amazing. I just can’t stop listening to it. My favourite songs are Honeymoon Avenue, Right There (feat. Big Sean), Piano, Popular Song, Daydreamin’ and Almost Is Never Enough. Ariana’s voice is one of a kind and I was soo happy when her album came out I had to buy it straight away. The Vamps are a British Band who have recently released their first single “Can We Dance”. It’s got a rock ‘N’ role feel to it but it’s also very catchy. I can’t wait to see what they’re going to come out with in the future. I love the boys because they’re all very cheeky and they make me laugh when I watch their youtube videos. "Halloween 2013 | Lush Must Haves"